Hey, did you hear the one about the flashy blockbuster remake of the New Testament action movie that managed to attract neither the Game Of Thrones nor the Passion Of The Christ crowds? No? 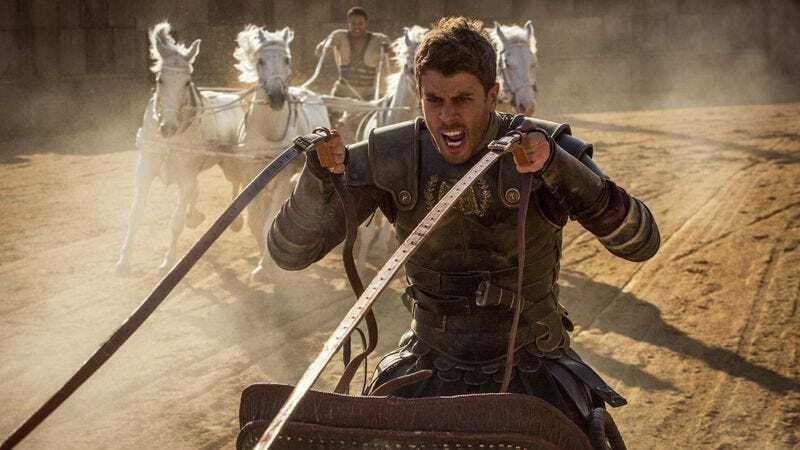 Us either, considering we barely even thought about Ben-Hur until the headlines started appearing this weekend calling it the newest big-budget flop in a summer full of them. What will hereafter be referred to here at The A.V. Club as “John Carter of Rome” came in at a disappointing No. 5 at the box office, recouping a mere $11.35 million of its estimated $100 million production budget (not counting money spent on ads and such). So what were Americans going to see instead? The now officially critic-proof Suicide Squad, coming in at No. 1 for the third week in a row. (Somebody should tell audiences that these guys are supposed to be underdogs.) Further underlining the public’s love of cartoon characters doing crude things, Sausage Party—which was actually quite well-received by critics—held its position at No. 2, adding $15.32 million to the $65 million domestic gross it’s allegedly not sharing with its animators. Further down the charts we’ve got this weekend’s other big new releases, including War Dogs—the beginning of a new, politically charged chapter of director Todd Phillips’ career—at No. 3 and Laika’s latest triumph, Kubo And The Two Strings, at No. 4. While both did solid business, neither exactly set the box office on fire in an industry climate that considers anything less than an exponential return on investment a failure. That “meh” feeling continues scrolling down the remainder of the Top 10, which includes such ”yeah sure, why not” live-action moviegoing experiences as Bad Moms (No. 7), Jason Bourne (No. 8), and Florence Foster Jenkins (No. 10). The big takeaway from this summer so far seems to be that, ever-reliable superhero tentpoles aside, family films are a smart bet. The Secret Life Of Pets is doing huge business overseas, and while it’s still a bit short of its $65 million production budget at $42.8 million, Disney can still be proud of the rave reviews for its Pete’s Dragon remake, currently at No. 6 at the domestic box office. Perhaps a kid-friendly mo-cap talking chariot next time?